Today is the DAY!! Vote for Lend 4 Health!!!! What a fun Halloween!! I wasn't really expecting much this year, since Michael has been so sick this week, and has been avoiding any discussion of Halloween. He seemed happy and relieved to stay home from school today - missing the parade and party. But, we had found a discount costume, just in case. When we started getting the candy ready, he was a little wary. Then he seemed a little sad that all the candy was 'give away candy'. It was wonderful to see his eyes light up when we gave him a few candy corns that he could eat. Then, when the doorbell rang, he was so happy to give out treats and wish everyone a Happy Halloween. It was so cute. And, he was an absolutely adorable little fireman. OK, sometimes you learn things the hard way. Sometimes you learn them the very, very hard way. We gave Michael his morning dose of flovent. Within minutes he went from a happy child to a complete terror. Just before the dose, he had told Steve what was happening in the movie he was watching. Soon after the flovent, he threw two trains across an entire room. It took him over 20 minutes to calm down. Once he was calm, Steve checked the information sheet on flovent. Sure enough, it contains soy lechitin. We won't be giving him any more. Now, I just have to figure out how to get it out of his system. I never expected an inhaler to have soy! Update: We called the manufacturer, because newer information no longer lists soy as an ingredient. They said the batch we had did NOT have soy, but want us to send it in to check for contamination. All I know is that Michael was nuts right after it, and is thankfully much calmer now. Busy Day - Dr Appt, IEP Reivew, and a Nutritional Consult! Yesterday was a busy day! We had a doctor's appt, an IEP review meeting, and an appointment with our nutritionist. Michael was up all night Wednesday night coughing and starting to wheeze, very typical of the beginning of a cold for him. So, I kept him home from school and made an appt with the pediatrician. She checked his lungs and said they were clear, but that she wanted him to use both the albuterol and the flovent for the duration of the cold. Michael loves his 'breathing tube' because it always makes him feel better. Once we were back home and settled in, it was time for Steve and me to go to Michael's IEP review meeting. I always get nervous before the meetings, just because I've heard so many horror stories. But, we've been very lucky. Everyone who works with Michael is so caring, and really does have his best interests at heart. Of course, I got even more nervous when I realized that the school principal was sitting in on the meeting! After Michael's behavior at school on Wednesday, I was convinced there was a major problem. Thankfully, the principal said very quickly that he was sitting in on more IEP meetings since the Learning Center Administrator's position had been cut to half time, and he was trying to help out more. The meeting actually went very well. I had been concerned that Michael wasn't doing as well in math, based on the 'math facts' tests that come home each week. Apparently, that's only a small part of what they are working on, and is his weakest area. He is doing well in almost every other part of the math curriculum. We think the problem with the math facts is more an attention issue than anything else. In fact, attention seems to be his biggest problem at school – attention and anxiety. I believe the two are strongly related. Michael's other big issue is writing. He has such poor muscle tone that his hand tires very easily. If he is presented with a large (to him) writing assignment, he will often work hard to get out of the writing, rather than just do it. The OT assessment that we brought also agreed that his writing skills are very weak, and the muscles themselves are weak. Based on all this, he will be getting a small word processor that he can use, but only when he needs it. I definitely want him to keep building up the hand/finger muscles he has, but need him to be less anxious about when he just needs some help. I really hope this works, because I know he has a lot to say! After the IEP meeting, we came home and I settled in to get some work done. Most of the afternoon was spent actually working and getting some code written. Michael settled in with his uncle and had a quiet afternoon. That was very nice! The last scheduled event of the day was our nutritional consult. I've been concerned about yeast coming back, and excited about all I learned at the conference last week. It was nice to talk with Kelly and come up with a good plan to keep moving Michael forward. The best part – we are now down to just one liquid supplement! Everything else is in capsules or pills. It's nice when things get easier! Of course, I have some new things to order, but that just comes with the territory. The only bad part is that I think Michael is allergic to Kelly's dogs. They are supposed to be non-allergenic, but he finds a way! I think it's worse because he plays on the floor and gets more exposure. On the way home, he had a major tantrum – hitting, kicking, taking off his seat belt. What should have been a ten minute drive ended up taking closer to half an hour. But, he was over it soon after we came home and gave him some benedryl. It's hard to be too angry when you know he's not feeling well. After we all settled in, I had more work to do since I lost time to the morning meetings. But, the rest of the night was calm. I'm glad we got so much accomplished during the day, but sometimes a nice, peaceful night is worth it's weight in gold! Who knows what today will bring! Michael has had a pretty good week, at home and at school. But, tonight he is fighting a cold and is generally pretty grumpy. His teacher called today to let us know he'd had a few meltdowns at school and was just really struggling today. I think he got overwhelmed with a writing assignment had an allergic reaction to touching the outside of a pumpkin, in addition to just feeling pretty lousy. I feel bad for him, but am so glad that he decided to go to bed early tonight. If you haven't cast your vote for Lend 4 Healthyet, please do! The contest is almost over, and your vote can make a difference!! My brain is so full. After attending the DAN! conference in the spring, I thought I was prepared for the barrage of information at the Autism Expo last week. I was wrong. I guess when you hear a message several times, from several speakers, it starts to sink in. I'm finally making more connections between environmental triggers, mitochondrial damage, toxins, inflammation, and the body's ability to function. I never realized how interconnected everything is. Before this conference I was relying on our team to guide us in the right direction regarding supplements, medication, and therapies. Now, I'm finally starting to understand how they all interact. I am so thankful that we've had such good experts to manage Michael's recovery! Every lecture further impressed on us the need to heal Michael's immune system and digestive tract, and to minimize further damage. Coming out of the conference I am energized on several fronts. I really want to make sure that we keep Candida at bay. I've seen the terrible effects it has had on Michael, and I never want it back. We have a nutritional consult scheduled for this week, and I'm really looking forward to it. I am also trying to get through the Feast Without Yeast book. It sounds scary to implement, but if it's our only choice, that's what we will do. I also want to investigate Cranial Sacral therapy. Until the lecture by Dr. Simkovich, I never understood how this therapy works. Now, I understand how the tiny movements in the cranial bones can affect the brain. Once you think about the interaction between the anatomy, the brain, and the spinal column, it starts to make sense. Now, to find a local practitioner with experience and results! The more I hear about HBOT, the more I want to try it. Given the circumstances of Michael's birth (heart beat issues, oxygen, unplanned C-Section), I think there is a strong chance that it would help. Again, trying to find a local practitioner is next to impossible. Buying our own unit, or renting one, is so expensive. If you see a donate button pop up one of these days, you'll know why! I'll probably have more to say over the next week or so, but for now I think I'll leave the conference summary here. Although, another good thing is that I think I'll be able to convince Steve to go with me again. And that's a wonderful thing! I didn't intend to write an entry today since we're packing up to go to Pittsburgh. But, as I was packing a prayer that my Aunt (also Michael'd GodMother) gave me, I really wanted to share it with you. I've changed the references to Michael, but you can easily change them to the name of your child. It just seems like such a powerful, and appropriate prayer for our children. the darkness of Michael's understanding. Today was a really great day. Michael did well at OT, cranked right through his homework, and just had great listening all night. Then, when it was time to go to bed, he was playful and giggly. They had read the "Sally sells seashells by the seashore" poem at school. I think we came up with every rhyme possible, and all the silly sentences he could come up with talking about it. It was so much fun. So, he got to sleep long after bedtime, but I don't know that I have ever felt so connected for such a long period of time. In some ways, I didn't want it to end, even though I knew he had to get some sleep. Tomorrow is a big day for me and Steve. We're going to the Pittsburgh Autism Expo, and leaving Michael with his uncle. I think I'm going to miss him more than he will miss us. He already has planned out all the fun they're going to have until we get home Saturday night. I'm really looking forward to hearing David Kirby speak, and just getting away with my husband for a few days. Hopefully, I'll be more educated and much more relaxed when we get back! We gave Michael his last dose of diflucan today. It will be nice not having to deal with the sticky liquid stuff, but I am so worried that the yeast will come back. He's been such a different child since he's been on the medicine. We have really cut back on the yeast feeders in his diet, but haven't eliminated everything. I guess I'm going to have to keep a close eye on him the next few days/weeks and make sure the OCD, aggression, and other bad stuff doesn't come back. They only sources of yeast feeders would be about 3 chocolate chips per cookie – the rest is sweetened with agave nectar, a slice or two of apple per day, and a few sips of chocolate DariFree once in a while. He does eat popcorn, which I've heard varying opinions on. Everything else he eats is sugarfree, carb free. It's such a battle to get him to eat new foods, I just can't bring myself to take away the few things he's left with. But, I guess we'll find out what we need to do next as the next few weeks unfold. Cross your fingers for us? Lord, Grant me the wisdom to accept the things I cannot change, the courage to change the things I can, and the wisdom to know the difference. I cannot change the past. There is absolutely nothing I can do about the fact that Michael was hurt by the vaccines we allowed. I thought I had done all the research, and that I was making the best decision for my child. I still have a lot of guilt that I should have known better. But, that is the past, and I cannot change it. Feeling guilty just diminishes the energy I have for the things I can change. There are so many things I CAN change: I can help Michael heal; I can help other parents; I can help other children. There are three things to consider when trying to help your child: Is he getting everything he needs? Do we need to remove things that are hurting him? What damage needs to be repaired? The getting everything question can be a little complicated. Our children have notoriously fickle appetites, so we can't rely on them to get their nutrition from the food they eat. We have been working with an excellent nutritionist, Kelly Dorfman, for several years now, and she has made a world of difference. Michael gets a ton of supplements every day, literally from A to zinc. Life got a lot easier when he started swallowing capsules. But, even as a toddler, he has always been good about taking his supplements. Somehow, he has always known that the supplements make him feel better. Removing things that harm is even more difficult. After blood tests, we found out that Michael is IgE allergic to peanut, wheat, and egg. He cannot tolerate eating anything with dairy or soy. So, five foods had to be removed from his diet. We had to go over every food and every supplement, and make sure they didn't contain anything he couldn't have. We missed a few the first go round, but I think we're OK now. It was a major lifestyle change to cook almost everything from scratch, to forget about eating out, and to read every label carefully. But, the results have been well worth it. Now, if Michael gets something he shouldn't, it's fairly obvious, and we can fix the problem. And, we've gotten a bonus. Now that Michael is no longer eating any of the five foods he can't have, he is much more willing to try new foods. This last week alone he has eaten chocolate DariFree, apples, and steak. He has tried these foods before, but never eaten enough of them for me to consider it an addition to his 'list' of acceptable foods. I'd always heard that children eat more when on the right diet, but never truly believed it. I'm a believer now! Removing harmful things also means making sure that he's not being exposed to everyday chemicals that can further weaken his system. I was never a 'green' person until I realized the effect the environment has on Michael. We have replaced all our Teflon cookware with stainless steel; I clean with as few chemicals a possible; we limit pesticides to the minimal necessary outside the house (we live at the edge of a huge forest, so some are necessary to keep the critters outside). Every small step is something else to help keep Michael's immune system from further harm. When it comes to repairing the damage, I'd really suggest working with a DAN! doctor. The biggest gains we've seen this summer came from four prescriptions: methyl B12 nasal spray, lithium cream to help with aggression, flagyl to kill bad gut bacteria, and diflucan to kill candida in the gut. With these four changes (sequentially implemented), we have a whole new child. He's happier, better able to express himself, and much less anxious about life. I can't wait to go back to Dr. Megson to see where we go next! Helping other parents can be challenging. Every parent I meet wants their child to be as healthy and happy as possible. But, we all hear conflicting information. If the pediatrician you trust and respect tells you there is nothing you can do to heal your child, it's comfortable to believe them. If you see a celebrity on TV claiming their child no longer has autism, you want the same thing for your child. My best advice to other parents is to do the research and talk with other parents. Many parents see where Michael is today and say "Oh, he's starting out so much better than my child." What they don't realize is where Michael started. When he was first diagnosed, Kennedy Krieger told us he wasn't high functioning and gave us little hope for his future. He had lost almost all the words he had learned, and had almost no understanding of anything that was said to him. He was content to sit by himself and stim all day long. Now, he still has a long way to go, but he has solid functional language, enjoys the company of people he loves, and is doing well academically. Steve and I talked way at the beginning of our biomed journey and set one rule: we will do everything we can to help heal Michael, but only using methods that are safe. The books I list in my favorite books section detail steps you can take to begin the process. The websites and DAN! conference are another wonderful resource. But, before you begin, set your own rules, and find professionals to help you. Finally, helping other children. Nothing is sadder than hearing about a parent who desperately wants to heal their child, believes in biomedical interventions, but can't afford to implement them. Please see my post yesterday about Lend 4 Health. When you read the stories of the children there, you can't help but want to make a loan. It's a small thing you can do to affect another child. Now, about the wisdom to know the difference. I'm still working on that one. I'm an idealist who wants to help my own child and every child I meet. I know some parents are receptive to the concept of biomed, others aren't. When I find someone who isn't receptive, I can't judge them just as I hope they don't judge me. I just hope that as they see Michael's amazing progress, they will reconsider. I've been meaning to write a post about Lend 4 Health for a while now, but was waiting to be closer to the IdeaBlob contest. So, I guess now is the time! I love the basic premise: interest-free micro loans to people struggling to pay for biomedical treatments for their children with autism. You can loan as little as one dollar to help fund a child, or you can fund the whole treatment if you have the money. And, it's not a donation - it's a loan. The recipients will pay the money back over time. You can then take your money, or reinvest it in another child's treatment. You often hear the phrase "Autism Community", and it's true that there are so many of us affected by autism in one way or another. There are many local support groups for parents. But, it's also true that helping your child with biomedical treatments can be incredibly lonely. There are internet based support groups, but very few people have access to anything local. What does this have to do with Lend 4 Health?? Lend 4 Health is building a biomed community that directly touches children's lives. It lets those of us who have extremely tight budgets help each other's children. It brings us all together to support all children 'doing' biomed, and their families. I love watching Tori's video because our family has made loans to several of the children featured. We feel that we are part of their recovery, in addition to our own son. That's a powerful feeling for families who often feel powerless. So, please visit Lend 4 Health, look at the children who have been helped, nominate the next child, and just appreciate the community there. Then, please vote in the IdeaBlob contest, so Tori can expand this wonderful, effective program! Is it selfish of me to regret the times I'm not able to see Michael doing wonderful things? Michael didn't have school today, so Steve took him to the adventure park to play. 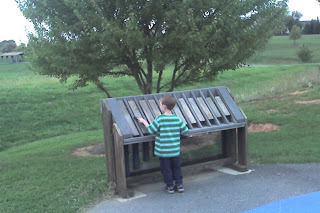 For the first time in ages, he played appropriately with the equipment, and explored all around the park. The last few times we took him to this particular park, all he wanted to do was to play with the mulch. He was only willing to try a few pieces of equipment, very timidly. Today, he was running around, trying everything, and just being a kid. I'm sorry I wasn't there to see it all, but so happy they had such a good time. I'm not sure where this new confidence is coming from, but it is wonderful to see. He is even getting braver about trying new games on the wii. When we first gave him the Outdoor Challenge game a week or so ago, he was only willing to try two games. He'd go back and forth between them, but get upset at the mere mention of a new game. Last night he tried at least four new games. He even went back to two of them! I can't even begin to express how exhausted I am right now. So, it's going to a quick entry tonight and then off to bed. Michael has a Christmas book that he likes to read in the living room. He never talks about it, but it's one thing he does to get away from everyone and have some quiet time. I found out that he has been playing with a mish-mash of train toys downstairs, and one of the main characters is Santa driving a train. Apparently, he has quite the story he acts out. So, reading comprehension plus imaginary play equals one very happy mommy. Other than that, school has been better this week with many more stars and many fewer meltdowns. He's still not eating and drinking enough during the day, but he's starting to make up for it at home. Definitely a good thing! Sorry I missed posting yesterday, but life has been a little crazy the last few days. We pick up two new activities this week; I have 2 offsite meetings on days I'm normally home; and juggling the schedule has been crazy. I am so thankful that Steve is totally committed to Michael's recovery, and has a lot of flexibility in his job. Between the two of us, we'll get it all done – somehow. I'm not quite sure why, but Michael has been a lot more emotional the last week or so. One minute he's playing or working nicely; the next he has a mini meltdown. He seems to recover quickly, but it's odd to see him so fragile. We are at the end of our tube of lithium cream, so I am wondering if maybe the end of the tube is less potent than the beginning. We'll start the new tube tonight and see if it helps. I remember seeing dramatic results when we first started the cream, so I am really hoping our solution is as simple as starting a new tube. We started the new OT today. Michael was skeptical going in, but warmed up quickly and did well overall. He really wanted to play with all the great toys, but did manage to get a lot of work done. She seemed to really understand what she was seeing with him and has a plan to help with his overall body control, as well as fine motor skills. The downside is that the only time she had available was at 3:00. That means he'll miss music every week, but I think it's worth it. She also has us on a list for a later time. Hopefully, something will open up soon. Tomorrow is Thursday, and there is nothing on the calendar. Then, there is no school Friday, so we have a three day weekend. After the frantic running around of the last few days, I am really looking forward to a little quiet. Who knows, we might even drag out some paintbrushes and paint some stick figures. No matter what we end up doing, I'm sure it will be fun! Today was a really good day, and a really bad day. After all the good stuff we've been telling you about, I guess we were due for a setback. First, the good. Today was the open house at Michael's elementary school. So, we got to spend 2 hours in the classroom(s) with him, and see his 'other' life. In the special ed room, he stayed in location pretty well, did what was asked of him, and participated. It was great to see some of his strengths. When it came time to see him in the mainstream room, it was obvious that he doesn't have the self direction to be there full time yet. Where the other kids could go from center to center and do the assigned tasks, he needed constant help focusing. He could read the assignment, answer the questions, and do the tasks. However, if there wasn't an adult with him, he'd be all over the room, getting into everything. The bad: he had two major meltdowns today - one at school, and one at home. He recovered fairly quickly from the one at school, but the one at home took longer. Since it was so out of character for him, we had to do a little digging to try to figure out what happened. When we opened his lunch box, most of his lunch was untouched, and his water bottle was mostly full. Given that he was hungry and dehydrated, I'm not surprised he had trouble controlling himself. We also found out he had a headache most of the afternoon. So, we're giving him the benefit of the doubt, and trying to work with the school to keep him fed and hydrated. He was a little nervous at bedtime since he knew he got a bad report from school. It was nice to see that he was actually reassured when we told him that the teachers knew he wasn't feeling well, and that no one was mad at him. We told him that tomorrow is a whole new day, and he can make it a great one. Hopefully, he will! Michael drank chocolate 'milk'!!! This is a child who drinks nothing but water. No juice, no soda, no milk substitutes. He drinks water, and only water. Today, he had gotten chilly after a long bath, and I asked him if he wanted something warm to drink. He actually said yes, so we made up a cup of chocolate Dari Free. I added some cool water so it was warm but not hot. After a few minutes of coaxing, he agreed to try a sip. Then he wanted another sip. Pretty soon the whole glass was on his desk. He actually ended up drinking about half a cup worth. I was shocked. Of course, now I am worrying that it would feed yeast. But, it also provides calories he desperately needs. For now, I'm calling it a huge win! He made it through a 3 store shopping trip with no meltdowns, no long interludes watching automatic doors, and no major fussing. We had to work around some of his weaknesses, but overall the trip was hugely successful. I'm still in shock that we went out and came back with what we intended to buy. Otherwise a quiet day, and I appreciate that! I never thought I'd be so excited over a video game! We've spent a lot of money in the last year on wii games hoping Michael would play them appropriately. Unfortunately, he spends most of his time fussing with the menus, and little time actually playing the game. Today, we introduced him to the Active Life Outdoor Challenge game. He actually played!! He spent well over an hour playing the Whack a Mole and Timber Trail games!! Now, I know that even with kids on the spectrum, playing video games isn't all that big of a deal. But, if you remember my post a couple days ago, Michael has a LOT of body awareness issues. For him to see the mole, figure out where to stomp, and then stomp the mole before it disappears… it's HUGE!! And, he really likes the game, even though it's challenging for him. The other game he likes is a timber trail game. You basically run in place and jump over logs that come rolling toward you. Sometimes he finds it more funny to crash into the log than jump over it. But, sometimes he actually wants to get a good score. He's never played a game 'to win' before. So, I'm just extra excited about that. He's still nervous about new games, and covers his ears a lot at the music. But, I'm still so happy that he found two games to play. There are probably a dozen more that he's afraid to try, but we'll get there! Ever have a nice, quiet evening planned out, and then your child re-writes all yours plans? Normally, when Michael disrupts our plans, it's due to illness, a temper tantrum, overall clinginess, or general poor behavior. Tonight, I was planning on just staying home being quiet, knocking off a chunk of homework, and eating leftovers for dinner. So, on the way home from school, Michael and I were talking about what he wanted to do when he got home. He's been on a Charlotte's Web kick, so I expected him to want to watch a movie and maybe read some books to the baby doll. He very clearly said, "I've had enough of movies. I NEED my Grandma." So much for my plans. Thankfully, Grandma lives close by and didn't have plans of her own. So, Grandma came over and Michael has been playing pretty nicely. They read together, did some worksheets, and even played catch with his balance ball. Yes, the ball is as big as he is. Right now, they are swinging on the deck 'helping' Daddy grill some burgers for dinner. And, I get some quiet time to think, write, and reflect on how sometimes a change in plans is a wonderful thing. We've been taking Michael to the same chiropractic practice for just about 3 years now. When we first started, we had an unpredictable child with a lot of sensory issues and a doctor who was skeptical that chiropractic could help at all. We were unable to watch the orientation video because Michael couldn't tolerate the sound of the television. Waiting for our turn wasn't too much of a problem because Michael liked to stim on some of the toys. He didn't play with them appropriately, but he was entertained. The initial evaluation showed a tightness on both sides way at the top of Michael's neck. The doctor agreed that it was definitely something we could work on, and we started out with a neck adjustment on each side, twice a week. As time passed, we dropped down to once a week, every two weeks, and now once a month. We've tried to extend longer between visits, but so far, every four weeks seems just right. The doctor is able to do a few more adjustments, and Michael happily climbs up on the table for his treatment. It hasn't always been this easy. There have been many, many times where Michael got bored in the waiting room, threw temper tantrums, and/or just didn't want to be there. But, we kept up the chiropractic, along with all the other biomedical interventions we've been doing. For a long time, as soon as we saw any kind of improvement, we had a corresponding decline in behavior. There were times I expected to be asked quietly to come back another day. But, the doctor and the staff have embraced Michael as he is. They've rejoiced with us over every milestone, and gritted their teeth through the worst behavior. Having a month at a time snapshot really gives the doctor a good idea of Michael's progress. He's seen a slow and steady improvement in his chiropractic symptoms, as well as a decrease in negative behaviors. Through it all, the doctor has always talked to Michael, asked him questions, and treated him with respect. Today, he was shocked when Michael actually answered a question or two. Today was also the first time that he asked for our DAN! doctor's name. I think we've made an impression! Have you ever noticed that when your child has a good day, you have a good day? And when he's having a rough time, your whole day just seems to go downhill? Today was definitely a good day. We kept Michael home from school because he was scheduled to get an updated Auditory Processing and OT evaluation this morning. It was so nice to sleep in those few extra minutes and have an unhurried morning! My husband took Michael to the exam, and I waited (not so) patiently by phone in case they needed my input for anything. The appt was scheduled for 10:00, and by 12:30 I was getting concerned. But, then the phone rang and I started to get a summary. Michael has made amazing progress in several areas: auditory figure/ground, dichotic listening, and even visual motor integration. It's a lot of technical words, and I'm not sure I understand it all, but one thing really stuck out: he had improved his handwriting by more than two years since the last eval one year ago! Despite all this wonderful progress, Michael still has a long way to go. I've long suspected that he understands almost everything he hears, but it's so nice to have it confirmed! I've also been concerned that even though he does great with reading, he doesn't seem to understand math concepts as well. Spatial awareness and body control also seem to be weaknesses. We talked with the therapists for quite a while about all this and decided to change our focus from auditory comprehension to body awareness. This will mean a mini loop sometime before the end of the year, and trying to get in with a good OT. I'm excited and overwhelmed at the same time: it's so nice to hear good news, and exciting to pursue a new path, but overwhelmingly difficult to get there. It's so hard to find an OT near us, and none of them take insurance. So, I'm committing us to even more expenses, paperwork, and scheduling. But, hopefully, the results will be worth it. Then, I look over at Michael, and see a happy kid playing appropriately with toys, and KNOW that he's worth any effort. This weekend we saw a minor miracle at our house: Michael pulled all the books out of his school 'book bag', dragged his baby doll over to a chair, and read every book in the bag to the baby. This is amazing in so many ways – he NEVER reads out loud. Some of the worst battles we ever had were trying to get him to read out loud while doing his 'headphone homework' between Tomatis loops. He doesn't have a lot of pretend play, but he was actually propping the baby up so he could see the book, and asking the baby questions. It was so adorable. Plus, he was reading with inflection, and clearly had favorite stories. I know that none of this is remarkable for typical kids his age. But for him, and us, it is huge. I was sad to back up the bag of books and send them back to school this morning. But, when I told his teacher what he had done, she assured me there would be another bag coming home soon. Never did I imagine I'd be excited about getting homework! I'm not usually a political person - I'm registered independent, and I vote on issues rather than party lines. But, in the last few months, I've really been drawn into the issue of the vaccine-autism controversy. Like many parents, I watched my son slip away after a series of shots, culminating with the flu shot. I thought I had done my research, that mercury was out of all childhood vaccines. And, I listened to the advice of our pediatrician. Now, I know a lot more and my son hasn't had any shots since his diagnosis. I was happy to see the announcement on Age of Autism that there would be a Congressional Briefing with updates and new information. I had naively assumed that my representatives would be eager to send staff to the briefing; that they wanted to know all the issues - not just the propaganda put out by big pharma. I sent an email to Congressman Van Hollen and Senators Cardin and Mikulski. The only response I got was a form letter from Senator Cardin saying that he supported the Combating Autism Act. Not quite what I had expected. I decided that if emails weren't answered, that they would respond better to a phone call. I was pleasantly surprised when my first call, to Congressman Van Hollen's office, was received warmly with assurances that a staffer was already scheduled to attend. I was less impressed when my call to Senator Mikulski's office only responded by saying that a health staffer would 'try' to attend. But, at least I got an answer on my first call. It took me at least 4 calls to Senator Cardin's office before a scheduler finally called me back. She told me that a staffer would attend the briefing. The day of the briefing I was hopeful that all my elected officials would be represented. When the list of attendees was published, I was disappointed to see that only Congressman Van Hollen had actually been represented at the briefing. Neither Senator had actually sent anyone, despite the phone calls and email. So, I want to say thank you to Congressman Van Hollen for responding, and for getting both sides of the issue. I'd also like to thank Representative Maloney for hosting the briefing. Finally, I'd challenge Senators Cardin and Mikulski at least read the transcripts of the briefing. I've been reading and enjoying a number of blogs for a while now, and figured it was time to set one up. Please bear with me as I'm pretty new to all of this. I have a pretty full life so I'm not sure how often I'll be posting, but I figure this will be a great learning experience. I have a six year old son with high functioning autism. My world revolves around him and his recovery. Due to multiple food allergies and sensitivites, he is gluten/casein/soy/egg/peanut free. We struggle every day, and have small victories every day. Life is never boring! We follow the DAN! protocol and have seen tremendous progress with it. 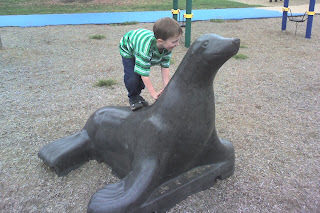 When we first started, my son was barely 2 years old, and considered to be 'moderately' autistic. We went to Kennedy Kreiger for the diagnosis and they were a complete waste of time and money. Basically, they told us "I'm sorry, your son has autism. Good Luck, Good Bye." From the time we walked out of their office, we have been researching every treatement out there, and trying the ones we think are reasonable. We are lucky enough to work with two wonderful professionals who guide us through the treatment maze. I went to an early intervention conference a few years ago now. The one thing I remember was the response of one parent who was told she was 'in denial' about her son's prognosis. Her response: "No, I'm in Hope". We have embraced that concept and made it our family mantra. We will do everything we can to heal our son, and hope and pray every day. It's working, and life is good (most days). My day job is to develop applications using Lotus Notes/Domino. I love what I do, and my job keeps me grounded in the 'real world'. Plus, the company I work for has a fantastic work/life balance program. I'm very lucky!